DAVID MORRISON: Sticks will include 20 new drawings in colored pencil of humble objects from nature, rendered in a trompe l’oeil, hyper-realist style. New York, NY (CHELSEA) Garvey|Simon is pleased to announce David Morrison: Sticks, featuring twenty of the artist’s unique drawings in Prismacolor from his intense studies of ordinary arboreal objects. The Opening Reception will take place on Thursday, December 17, 6-8pm. The artist will be present. The exhibition will run through January 2, 2016. David Morrison’s drawings capture organic degeneration, echoing the living conditions of human beings. 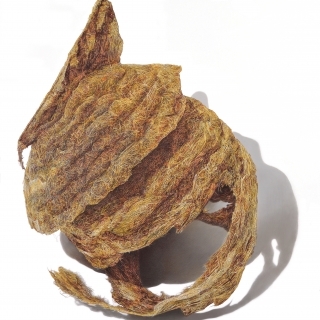 Morrison is interested in capturing the reality of existence, with its imperfections, fragility and grit -- distinctly different from that of idealized nature found in traditional botanical illustrations. In the finished drawings, the branches and twigs are isolated on a pristine white background, devoid of all distraction of other plant materials. Through Morrison’s examination of a simple scarified piece of wood, the viewer is invited to reexamine the realities of the natural world, and to re-think traditional definitions of beauty. Morrison is inspired by the intricacy of texture and subtlety of color to be found in the never-ending diversity of our environment. Seduced by the natural designs and patterns left from scarification, disease, infestation, decomposition and storm damage, the layers of bark found on simple twigs and sticks become his microcosm. Morrison’s exploration of these tree vestiges reveals a world of possibilities in color, light, texture and shadow. A master draftsman, he uses his skills in a way that transcends mere technique. The detail is beyond what a naked eye would ever see, and much is from his imagination – or, as he puts it, a bug’s perspective. Like bones or shells, these sticks also act as iconic vanitas devices, reminding us of our own mortality and temporal existence. David Morrison was born in Indianapolis, Indiana in 1956 and received his MFA in Printmaking from the University of Wisconsin-Madison in 1985. His colored pencil drawings are often nature-based, presenting iconic, humble subjects with a quiet focus that is belied by the intensely rendered, almost microscopic details that appear upon close inspection. Morrison has exhibited widely, and his work is included in numerous public collections including The Whitney Museum of American Art, The New-York Historical Society, The Corcoran Gallery of Art, The Smithsonian American Art Museum, The Nelson-Atkins Museum of Art, and the Portland Art Museum to name a few. This is his second solo exhibition in New York, and his third solo exhibition with Garvey|Simon. A visiting lecturer and guest artist at numerous universities, Morrison is very involved in the world of printmaking, specifically stone lithography, and he is the Professor of Printmaking at Herron School of Art and Design, Indianapolis. For more information about each artist or high-resolution images, please contact Elizabeth Garvey at 917-796-2146 or liz@garveysimon.com.